In Support of the “Relfie”. The steadily growing selfie trend has been criticized time and time again for denoting vanity and narcissism, as well as for its tendency towards posturing and inauthenticity. Because flattering angles, filters and editing tools are used liberally in selfie culture, some people view takers of selfies as “fake” and attention-seeking. In spite of society’s tireless tirade against the selfie, I will always be in full support of it for the reason that, in my opinion, there is nothing inherently wrong with seeking attention. You are indeed gorgeous and noteworthy and you should share your mug with the world if it makes you happy! 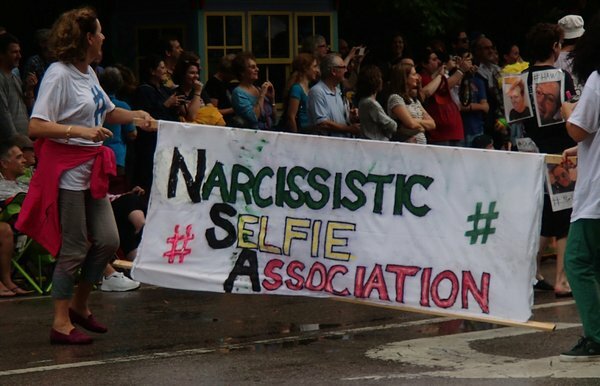 Selfies have the power to build self-esteem, forge connections through social networking and express one’s individual style and identity. Besides, there are far worse evils in the world than taking a photo of you and your new outfit. The “relfie”, a term first coined in Science of Relationships, refers to a photo of one and one’s romantic partner, taken by the couple in question. The relfie can be a way of informing others of your relationship status or commemorating a special event or experience shared with your partner. They allow us to be in control of the way our relationships are perceived by others. We live in a world in which we are often scrutinized for our personal choices and appearances, resulting in the feeling that our self-image is being hijacked by other individuals’ perceptions. Selfies have the potential to be an empowering gesture of reclaiming that image; of showing the world who you are through your own lens. The relationship selfie can be a public expression of fulfillment with your relationship, showing friends, family and strangers that you are proud to be with your darling; to be unabashedly who you are when you are with that person. They help us remember days and moments shared with our partners that may otherwise be forgotten. The camera is invariably brought out for special occasions like grad ceremonies and weddings, but what about that hot summer day when you ditched the city to go apple-picking, or that time over brunch when you laughed so hard you cried? You shouldn’t have to wait for an anniversary to document what is meaningful and good in your life every day. They are a way of acknowledging and celebrating your connection, intimacy and growth with another person. The importance of body language in romantic and sexual relationships cannot be overstated. Therefore, a relfie is worth a thousand words. How does a second date relationship selfie differ from a six-month one? Is the other face in the frame one you smile coyly at over dinner and drinks, or one you wake up next to each morning, comforting and familiar? Relfies can be a way to chart the progression of a relationship, and to be reminded of the chemistry that exists between you and your partner. 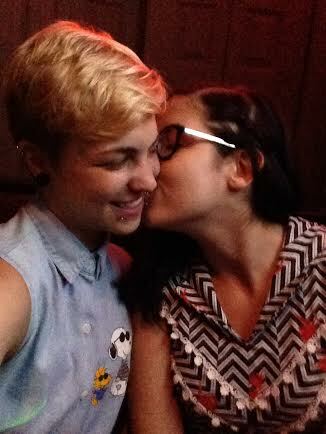 Being a queer woman with a genderqueer partner, visibility is extremely important to me. As a feminine-presenting woman, I am almost always perceived as heterosexual. This happens regardless of my efforts to deliberately identify myself as a queer femme; as someone who is attracted to people of all genders and presentations. This frustrates me to no end, and is one of my personal reasons for being “out” as a queer person, which, for me, entails being publicly open about my relationships. I feel that every relationship selfie I take is a proud assertion of the fact that I am not the straight woman others perceive me to be, as well as a way to normalize depictions of queer couples in a predominantly straight world. Social media should function as a platform to share and validate universal human experiences. One of the criticisms surrounding relfies is that the tendency to post photos of you and your significant other may be irritating or alienating for your social networking contacts. As with everything else, the posting of relfies can and probably should be done in moderation. As long as you’re not flooding your friends’ newsfeeds with couple-y photos on a daily basis, it is unlikely that anyone will be bothered. After all, the purpose of social networking sites like Facebook and Twitter is to stay up to date with the goings-on of your contacts’ lives, and to connect with others through the sharing of ideas and experiences. Love is just one of many experiences to be shared and celebrated, and social media presents an ideal forum for that communal expression.